Chelsea scouting chief Michael Emenalo is closely monitoring the progress of Ghana defender Samuel Inkoom, according to reports. 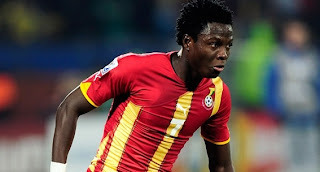 Inkoom is in the Ghana side that were set to face Nigeria at Watford’s Vicarage Road ground yesterday, although this fixture was cancelled due to the troubles in English towns. Ukrainian outfit Dnipro Dnipropetrovsk have made the 22-year-old available for transfer for around £6m. Inkoom is a new arrival at Dnipro following his move from Swiss Super League side FC Basel in January this year. He has been the subject of racial abuse since joining Dnipro and even had his house burgled. Fulham and Aston Villa have been mentioned as other potential destinations for the talented right-back.